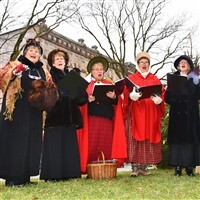 Step back in time with a visit to Wellsboro's "Dickens of a Christmas" Celebration. Victorian gaslights and live Christmas decorations lend the perfect setting to this festival. Old time Christmas charm fills this weekend vacation. Today we depart on a three-day getaway to Wellsboro, PA. Enroute, we will stop at Kohl's Stony Hill Tree Farm in Milton for a wonderful peek at a Christmas tree farm in action. Browse among a vast selection of ornaments on decorated trees, as well as beautiful swags and wreaths. View the owner's tree stand collection featuring over 1,000 items. Lunch will be on your own at Country Cupboard in Lewisburg. A stop will be made at Purity Candy Company where we will be able to see production through the glass and have time to shop. (Please note this site does not have public restrooms.) We will then continue onto our lodging for the next two evenings at the Hampton Inn & Suites in Williamsport. Our dinner this evening will be at the Le Jeune Chef, a teaching restaurant at the Pennsylvania School of Technology in Williamsport to learn about the school's culinary program plus enjoy dinner. After a continental breakfast at the hotel we will depart for the highlight of our tour, the "Dickens of a Christmas" Festival. A schedule of events will be available upon arrival. This afternoon we will attend a holiday presentation in Wellsboro. A dinner will be enjoyed at the Penn Wells Hotel before returning to our hotel. This morning after a continental breakfast at the hotel we will depart for home. We will stop for a tour of Rowley House, located along Williamsport's historic Millionaires Row. The site features wonderful woodwork, stained glass windows, English Minton tiles and historic furnishings. (Please note this site does not have public restrooms.) We will have free time for browsing and shopping in Lewisburg's Street of Shops before lunch at the Lewisburg Hotel. A stop will be made at Bill's Bike Barn - a collection of Vintage Motorcycles and Americana Memorabilia in Bloomsburg. This unique site is filled not only with motorcycle collections and memorabilia but also with collectibles from around the world including antique European carousel animals plus a special military display. With a rest stop enroute, our arrival home is scheduled for early evening.